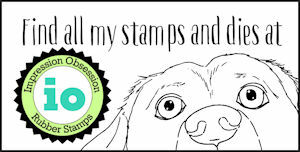 The Impression Obsession team's challenge today is to create a project for Easter! 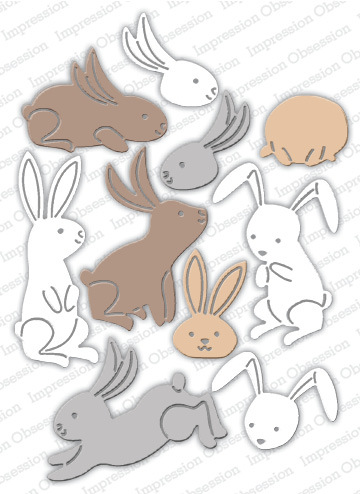 These little bunnies are all from one amazing set called Bunny Poses... so cute! I love all the variation in one complete set, as well as those layering pieces! The "paws" on the bunny hanging around the side of the egg are actually someone else's ears. I've got several grass dies layered at the bottom, as well as the banner die - I'll link those all below! The sentiment is from this Easter Basket clear set. Love this adorable card! Did you draw the faces on them? So cute. Wonderful Easter design. I love the egg with the stenciled design and the bunnies are so cute. This is a gorgeous Easter card! I love that egg with that chain stencil and all those adorable bunnies! This is as sweet as can be!! Such a cute card! Thank you for sharing the details.